The MIB program is designed to cultivate a global mindset necessary for today’s global economic environment. The program structure is varied to ensure that it will comply with a wide range of personal and professional objectives, and offers a mix of theory and hands-on applications to sharpen students’ skills and insights in different business contexts. Students have the possibility to partially customize the program so that it meets their needs and interests by choosing some of the electives in their curriculum. The program offers 2 intakes per year, one in January (Lille) and the other one in September (Lille & Paris campuses). Regardless of the starting date, the program is offered on a full-time basis and consists of 2 consecutive semesters of courses followed by a professional experience. Understand the impact of globalization on goods, labor and financial markets. This course focuses on financial globalization, that is, the opening up of a country’s financial system to capital flows and financial firms from other countries. It provides the necessary background to understand the basics of global financial markets, and then presents two important but related aspects of global finance; the existing financial regulation, the two recent financial crises, the subprime and the sovereign debt crisis. It also presents possible solutions to fix global finance. Understand what can be done to fix the global financial system. This course aims to transfer the main logics and methodologies of the principal HRM tools in an international context: planning, recruitment and selection, training, appraisal systems and compensation. The organizational development policies and practices are explained and discussed crosswise in relation to the development of each HRM tool. For all sessions, critical issues and problems related to the practical applications in the international context of the HR operational systems are identified and examined in order to enhance a pragmatic approach. Properly use the main methodologies related to every HR operational systems. This course presents an introduction to global marketing. The topics covered in class include the international marketing context, the selection process of potential international markets and alternative market entry strategies, the development of the international marketing strategy, and the standardization vs. adaptation debate when designing the international marketing mix. In addition to lectures, the course consists of (video) case studies, in which students will have to critically apply the concepts discussed in class and propose their own solutions to the various real-life problems and/or situations. Last but not least, students will be asked to work on a group project applying the concepts learned in class to a global company of their choice. An active, interactive, and critical approach is fundamental for this course. Construct and interpret management accounting information for decision making, planning and control. The objective of the course is to introduce advanced methods of project management. Understand how to organize project teams, considering the individual and social implication of the team working. The goal of this course is to give students the tools to create/maintain fruitful international business relationships through negotiation processes aiming to reach mutually satisfying outcomes. The content of the course will be centered on the following topics: distributive and integrative negotiation settings and strategies, the influence of culture in negotiation strategy and a glimpse into complexity in international negotiations. Overall, the objective is to provide key concepts and analysis grids, to be useful in various professional settings, in particular in intercultural settings. The course is designed to immerse students into the principles of descriptive and inferential statistical analyzes. Through lectures, in-class exercises, and a tailored online environment, this course addresses the collection, description, analysis and summary of data, including the concepts of frequency distribution, parameter estimation, hypothesis testing, and regression analyzes. Fit and interpret interactions between independent variables. See the importance of technologies to companies in specific industries. Have greater awareness about ESRS topics such as: planned obsolescence and website visitor tracking practices. Have greater awareness about ESRS topics such as: the relevance of CSR for companies that operate in international markets, triple bottom line, stakeholder theory. This course is based on a business management simulation game that integrates the functional areas of production, marketing, logistics, finance and strategy. It increases the participants’ awareness of operating a company from a general management perspective. Recognize the interactions among the various companies and external stakeholders in a complex and interrelated environment. In this business game, teams will develop and execute strategies for their simulated company operating in different markets with specific customer behavior, cost structures, and currency fluctuations. They will be required, in several rounds of the game, to make operational decisions and overcome various business challenges. Intercultural management is a multidisciplinary approach to the communicating and understanding problems encountered in interactions between individuals and society/organizations as well as individuals/ organizations interacting with global communities. The ability to understand and communicate appropriately is a crucial competence in all intercultural interactions. In this course, an examination is made of theories and research advanced by behavioral sciences in relation to the understanding of cross-cultural communication. The main aim is to fully explore cultural factors and their impacts on global managerial practice. Furthermore, this course aims to provide students with strategy, awareness and observation skills needed to succeed in any cross-cultural interaction and negotiation worldwide. 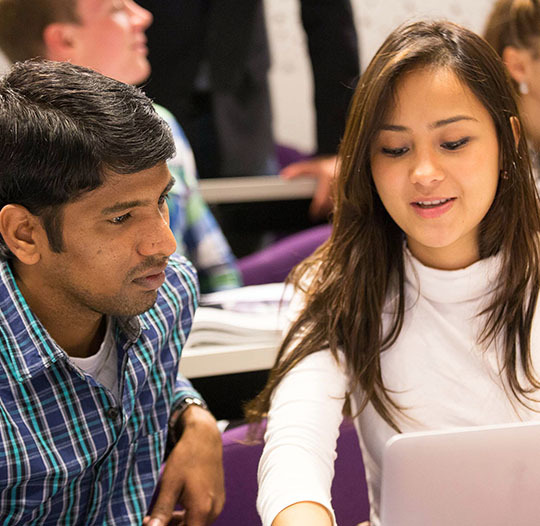 This course complements other management and marketing disciplines in developing cross-cultural management skills and knowledge essential for graduates entering managerial careers in increasingly globalised economies around the world. In a complex and fast moving environment challenges like globalization, diversity, competition, and sustainability require organizations and their constituents to continuously adapt, innovate, and engage in long-term improvement processes. Organizations, on the one hand, need to broaden their traditional view of business. They are required to adopt long-term perspectives, combine profitability with sustainability, behave ethically, while all the while managing various stakeholders’ expectations. Future managers, project managers, team members, on the other hand, need to embody ethical values and practices in their day-to-day (managerial) behavior in order for them, and their organization, to attain an ethical and sustainable competitive advantage. Identify personal strengths and weaknesses with regards to speaking in public. The aim of this class is to develop leadership potential. Through a series of lectures and exercises this class develops leadership knowledge, skills, and attitudes in four important leadership domains: task-oriented, relation-oriented, change-oriented, and ethics-oriented leadership. At the end of the course, the student should be able to list the major theoretical approaches to leadership classified under the following headings: task-, relationship-, change-, and ethics-oriented leadership. The students should also be able to apply the leadership skills and competencies under these topics in a leadership setting. Finally, the students should embody the core values, attitudes and identities associated with authentic leadership. The student should be able to present their own plan as a leader, acknowledging their strengths and weaknesses to do so and present this plan in front of class. Build self-awareness of personal vocations and interests. The MIB program has recently developed the new course BUSINESS CONSULTANT @ MICROSOFT’S AD ULTIMA GROUP. This course is taught by four top IT consultants, who help students understand how to use software to identify IT needs from companies. As the course unfolds, the students use data to build a project architecture and a project breakdown structure for a virtual company created for the purpose of this class. The four professionals evaluate students’ proposals and provide their feedback as to how to improve them.